Today Augusta announced the newest iteration of their iPad app for the 2016 Masters Tournament, which offers a live broadcast of all four tournament days. While the app was built from the ground up by IBM Interactive Experience to work on all iPads, the update has some new features designed to take advantage of the new iPad Pro’s larger, 12.9 inch display. For example, this year’s update adds picture-in-picture support, letting viewers watch a stream while simultaneously checking out the scoreboard or tracking player’s shots. And, with the increased screen size of the iPad Pro, even the smaller picture-in-picture is large enough to comfortably enjoy. The app will also now support multitasking – a feature Apple href="https://beta.techcrunch.com/2015/06/08/apple-ipad-gets-split-screen-multitasking-in-ios-9/">launched with iOS 9 last fall that allows iPad to show two different apps side by side. 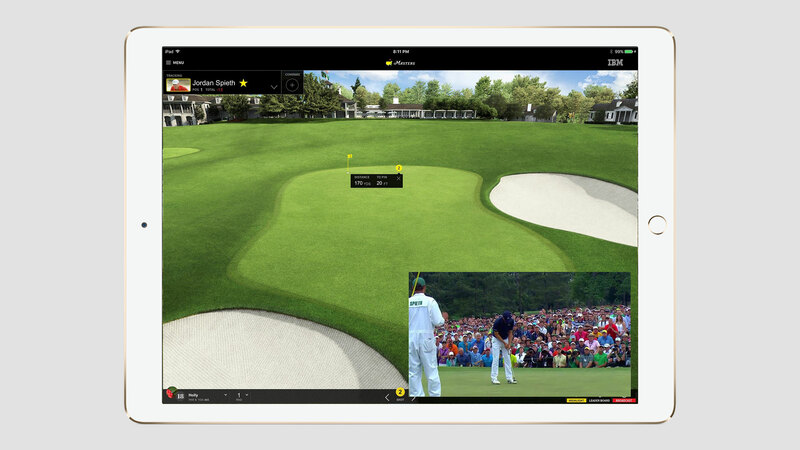 With these new features, an iPad equipped with the Masters app could now arguably be a better viewing experience then actually sitting down in front of your TV. This is especially true when you take into account the shot tracking and player comparison features, which serve as a good alternative to sitting through commercials and listening to boring golf TV commentary. Beyond the new features designed to take advantage of iPad Pro, IBM also is adding Apple Watch support into the new release. Watch owners will be able to check leaderboards from their wrist. The app can be downloaded from the iOS App Store today, and the Masters will run April 7th – 10th.